There is still no effective vaccine available for malaria, despite years of research. The malaria-causing parasite, Plasmodium falciparum, kills more than 660, 000 people every year. Plasmodium parasites enter our bodies when an infected mosquito bites us. First, the parasites invade our liver cells (in the form of sporozoites) before maturing into parasites that invade red blood cells (merozoites). The moment when the merozoites burst out of one blood cell before invading others is an ideal opportunity to try to treat the infection because the parasites are directly exposed to the person’s immune system. If we can create an effective vaccine to merozoites, we can prime people’s immune systems to attack the parasites, and destroy them, before they can infect more red blood cells, stopping the disease in its tracks. One way to try to make an effective vaccine is to target the structures (proteins) that the merozoite form of the parasite uses to invade red blood cells. These surface proteins bind with proteins on the surface of the red blood cell and allow the merozoite to gain access. By identifying these interactions and understanding which proteins are essential for invasion, we can try to create a vaccine against them. More than 50 merozoite surface proteins have been found so far. However, after more than 20 years of research, only six interactions between human red blood cell proteins and Plasmodium merozoite proteins have been characterised. In our recently published review (Bartholdson et al., 2013) we looked at why so few interactions have been identified and discuss problems associated with studying how proteins on cell surfaces interact with each other. 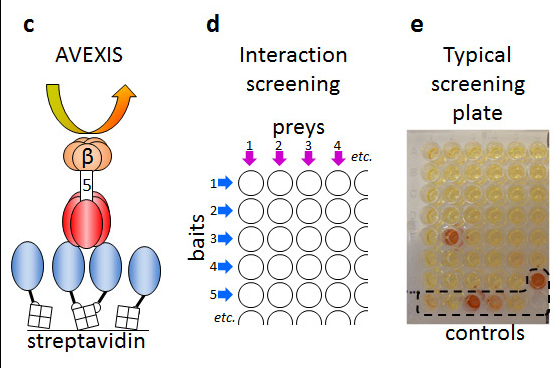 In addition, we explained how we overcame some of these problems and discovered two novel interactions using a systematic process to screen interactions between proteins called AVEXIS (Avidity-based Extracellular Interaction Screen). Most of the interactions between merozoites and red blood cells are likely to be weak with short binding times (half-lives of seconds), which means most interaction screens will not detect them. To do an interaction screen the proteins usually need to be produced using recombinant processes. Most proteins on the cell surface are membrane proteins which are tricky to produce in their correct shape and at usable levels. On top of that, it is notoriously difficult to express Plasmodium proteins. In c) the blue biotinylated parasite proteins are attached to the streptavidin-coated plate wells. The red red blood cell proteins are bound together in fives to increase the strength of attraction. In d) the same parasite proteins are attached to walls of the wells, and different solutions of different red blood cell proteins (bound in fives) are placed in the individual well. In e) only wells where the specific red blood cell protein bind to the parasite protein will turn red. The AVEXIS screen used in our laboratory has overcome some of these problems. To express the proteins we use only the ectodomains (the soluble part of the protein exposed on the surface), which are expressed in mammalian cells to ensure correct conformation. One set of proteins are expressed as biotinylated baits (which are attached to wells of a streptavidin-coated plate) and another as pentameric preys (five of the same protein bound together and floating in solution). Using five of the same protein bound together increases the strength of the interactions and the half-lives can increase from seconds to hours. This allows us to detect low-affinity interactions by an ELISA-based assay. We have also been able to successfully express multiple Plasmodium proteins by codon optimising the genes for mammalian expression and mutating out any unwanted glycosylation sites. The two new interactions we discovered by AVEXIS screening were Plasmodium Rh5 binding human Basigin and Plasmodium MTRAP binding human Semaphorin-7A (Crosnier et al., 2011; Bartholdson et al., 2012). 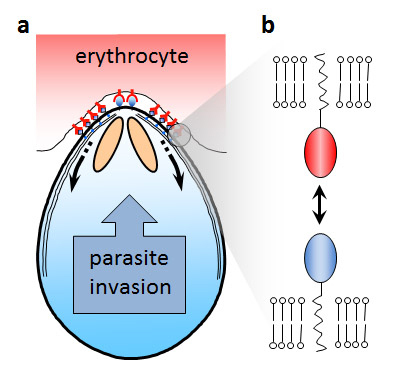 By investigating the interactions in parasite invasion assays we discovered that the Rh5 and Basigin proteins are both essential for invasion into red blood cells and that antibodies against both proteins protect against malaria regardless of which strain we tested (Crosnier et al., 2011; Bustamante et al., 2013). This research has led to Rh5 being a prime vaccine candidate! Bustamante LY, Bartholdson SJ, Crosnier C, Campos MG, Wanaguru M, Nguon C, Kwiatkowski DP, Wright GJ, Rayner JC. A full-length recombinant Plasmodium falciparum PfRH5 protein induces inhibitory antibodies that are effective across common PfRH5 genetic variants. Vaccine. 2013 Jan 2;31(2):373-9. Bartholdson SJ, Bustamante LY, Crosnier C, Johnson S, Lea S, Rayner JC, Wright GJ. Semaphorin-7A is an erythrocyte receptor for P. falciparum merozoite-specific TRAP homolog, MTRAP. PLoS Pathog. 2012;8(11):e1003031. Crosnier C, Bustamante LY, Bartholdson SJ, Bei AK, Theron M, Uchikawa M, Mboup S, Ndir O, Kwiatkowski DP, Duraisingh MT, Rayner JC, Wright GJ. Basigin is a receptor essential for erythrocyte invasion by Plasmodium falciparum. Nature. 2011 Nov 9;480(7378):534-7. ← Why is it hard to detect disease association in African populations?